Team Evotri: Easy as 1, 2, 3? Easy as 1, 2, 3? Well this has certainly been a roller coaster season! My attempt to race well at a big Xterra event in April didn't really go as planned. I enjoyed the challenge but the results were lacking. I knew that our new baby girl in early June was going to entail a significant break from training. The rest of the summer was one long struggle to get back into competitive form. My strategy was to race a lot and hit just about every workout pretty hard since I was on a low-volume training program. I didn't feel like I came into short course racing form until August. By sheer coincidence early August was also when my Evotri team all got new Quintana Roo bikes. The bike has been really good to me so far! I literally put it together on a Friday and then raced to an overall win the next morning! I think I've won 3 out of 4 of our local Tuesday Night Time Trials on the new bike. Suffering on the new QR during a time trial. I'm going to give condensed race reports for my last 3 races. This is a local-ish sprint race and one of my all-time favorites because I have been racing there for so long. This year was the race's 20th anniversary and I actually participated in the kids race there 19 years ago! This is a real roots race for me and being the 20th anniversary, I was gunning for a win. It was also Cara's first triathlon back since having Lorien in June. Chris Camp, a good friend from my grade school and high school swimming days has shown up as part of a relay the last two years. We were both sprinters, but he ended up a big Division 1 school where he did quite well. The week before Canton he pulled out a 47 sec 100 yard freestyle, so he's still got some speed! In the swim, I jumped on his feet right away and hung on for dear life. Fortunately for me, he doesn't have much open water experience and I held his feet for about 75% of the race. I blitzed through transition and jumped on my new Quintana Roo CD0.1. About 3 or 4 miles into the bike leg I had taken over the lead including the relay teams. I usually feel terrible on the bike during sprint tris, but my legs finally felt good for this race. Temps were good, winds were low. I averaged 23.5mph for a somewhat rolling course and still had a lot left in the tank. I hadn't been happy with my runs all season and wanted to turn in a fast 3 mile split. I took off with that intention, but it is really hard to push deep into the pain cave when you aren't chasing anyone. I ended up running a 17:36 for the somewhat hilly run. My time was about 2 or 3 seconds slower than when I won the year before, so that at least showed my race form was finally coming around. Cara managed a win in her age group and good friend and fellow Tri-Shark Aimee Dziekan took the overall win for the women. If you are one of the few that actually read everything I put up on my blog, you will recall that originally 2011 was going to be my big Xterra year, hopefully culminating with the World Championships in Maui. A variety of factors -chiefly financial- derailed this plan this year. I love racing Xterra, but the midwest races mostly require long drives and overnight trips which is hard with an infant and 3 year old! Anyway, this is the second year for Xterra Illinois Wilds which is held near Peoria, IL (about 1.5 hours away from home). This swim was 800 yards. I knew that Chris Scott who won last year would be near the front as well as my friend and local masters swimmer, John Pratt. This was a 1-wave start, so I really got out hard so that I wouldn't get caught up. I was near the lead for a bit, then caught John's feet for a few hundred yards until he dropped me. I think I came out of the swim in around 4th? I had done two mountain bike races this season, but really didn't get out to train much on my mountain bike. This bike course is actually quite technical and doesn't give you much opportunity to just open up and use your general cycling fitness. I was pushing pretty hard and taking some risks until I got into second place. Then I washed out on a loose corner and later went down really hard when I caught a handlebar on a tree. Some spectators saw my wipeout and just stood there with open jaws, so it must have looked pretty spectacular. Those two crashes caused me to slow up a bit and take less risks. I'm riding a hardtail 29er this year, coming off a full-suspension 26er. The carbon hardtail is fun, but I think I will eventually want to get back to a full-suspension bike for Xterra. As for the 29er vs. 26er debate, I don't think it is nearly as big a difference as people (and manufacturers!) make it out to be. The 29er is definitely better over obstacles and for high-speed descents. The 26er is better in tight terrain. I can't tell that the 29er has better tire contact, which is a common claim. As for the rest of the race, Chris Scott had first place locked up after the ride. I lost much less time to him this year than last which I was happy about since they added a couple miles to the bike course. For the rest of this race I ran hard, but really just hard enough to defend second place. Chris Scott cruised to the win about 6 minutes in front of me. I'll take that since I don't think he has lost an Xterra race in the midwest the past few seasons! Only other thing worth noting about the race is that Ryan Sutter of "The Bacherlotte" fame showed up at the race with a full camera crew. As I understand it he was chasing Xterra points for either nationals or worlds and was in Illinois for the Chicago Triathlon. As I recall, he raced Kona by actually qualifying rather than taking a celebrity slot. He is a Colarado native, so I had no idea what his off-road skill might be like. He ended up 5th about 6 minutes back from me, so a pretty solid showing - particularly since I believe he did the Leadville 100, one or two weeks earlier! Minus the camera crew, he pretty much just blended right in with all of us. Nice guy from what I could tell. Post-race at the Xterra. Note the birdhouse award and recovery drink! Like lots of things this season, choosing the Great Illini Half Ironman was a compromise. I wanted to finish the season with at least one half Ironman to see where my long course fitness was at. 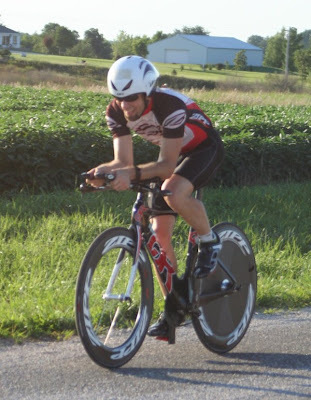 I also had my eyes on Branson 70.3 and Rev3 Cedar Point, but eventually defaulted to Great Illini because #1 it had the cheapest entry fee, #2 it was the closest and #3 I thought I had an outside chance at winning prize money. I've actually won this small half twice before, but it didn't have prize money back then. I didn't have time to do much volume this year, so I wasn't sure how I would hold up for a half. On the right day Great Illini can be quite quick and I thought I could turn in a time somewhere in the 4:20s. We did not have the right day. We had a downright sucky day. The race was the beginning of September, but summer temps decided to hang around for another week. I traveled down to the race with good Tri-Shark friends Laura Wheatley and Aimee Dziekan. My go-to pre-race restaurant when I am racing in Matoon has been the Amishland Red Barn Buffet and this trip certainly didn't disappoint! It's also Jonah's favorite because they have 4 colors of jello. A Dos Equis Amber at a little Mexican place by the hotel topped off my pre-race nutrition preparation. Who shows up at this event is a big toss-up. The prize money has pulled in a few pros and top age groupers in the past. This year the only one I knew for sure that was coming down was good friend Andrew Starykowicz. There went first place (but I think having Andrew race actually helped me. More on this later). The water was really warm and well above the wetsuit cut-off. I don't like swimming in a wetsuit if it is above 75, but I also don't like racing in bathwater even without a wetsuit. I ended up in second behind Starykowicz for most of the first lap of two. On the second lap my lack of swim training showed itself and I lost a little time to a group of about 3 athletes. I hit transition in 31 minutes and change which isn't great for me, but not bad for a non-wetsuit swim. The temps at the start of the bike weren't too bad yet. My long bike training consisted of 3, 3-hour rides where I pretty much figured out what sort of power I could currently maintain for 56 miles. I was targeting 225-230 average watts and ended up just a little under 225. Out on the bike I actually felt really good and started picking places back up. I think it took me about 15 miles to move back into 2nd. The course is mostly flat, but has a bunch of turns including 5, 180 degree turnarounds. The course had to be re-routed over some pretty rough roads that beat all of us up as well. One the second lap some of the olympic distance riders began to mix in with us. One guy went around me so fast I just assumed he was racing the olympic. For the record, when racing for prize money, it is really not a good idea to ASSume! It wasn't until an out-and back around 45 miles that I realized I was now in 3rd and down by quite a bit. I put some extra effort into the pedals, but was pretty fatigued at that point. My ride was 2:26 or about 23 mph. Not my best, but ok for this season. By the end of the ride it was pretty hot and humid. Having done the race a few times before I knew the run was completely open with no shade. It was scarily similar to the terrible conditions the day I won the Effinham Half Ironman a couple years ago. Starting the run I knew getting close to my PR was out of the question. Instead I just wanted to keep myself in the prize money and maybe move up to second overall. I started out at a pretty conservative pace that I knew I could maintain in the heat. I felt ok given the conditions and put some effort into the middle miles to see if I could close the gap on second, but he was running really well, so I went back to my strategy of defending third and not blowing up. The aid stations each mile couldn't come soon enough. The temps were in the 90s with clear skies and heat index around triple digits. I utilized one of heat management strategies of dumping iced down my jersey and pants -- and then eating that ice between aid stations! It is a beautiful thing, I just recycle all my electrolytes! Run was one of my worst ever times (1:40) which contributed largely to my 4:40 finish time. For comparison I've ran under 1:25 and finished under 4:25 on this course in better conditions. In any case, that time was still good for 3rd overall and my biggest triathlon payday to date. I'm pretty certain that having Starky show up actually kept me in the money because it kept away some other racers who knew they wouldn't win overall, so didn't show up. Thanks man! Seems like the hot race didn't phase Andrew much since he went on to win the Rev3 full the following weekend! 8:28 for his first full seems like a good debut! I think all of that leaves me conflicted over the season. I knew it would be really tough having a new baby in June, but it was REALLY tough! For a long time (see Lifetime Fitness race report!) it didn't seem like I was going to be able to get back into shape. I don't think I ever did get into very good long course shape, but I've got to be happy with these results from my last 3 races. Even if they were smaller regional races all of them had some good competition. I had lots of friends and teammates racing IM Wisconsin and Rev3 Full and it really made me want to step back up to that distance. I just don't see it happening soon though. When I go back to Ironman racing I want to do it right. A sabbatical in a couple of years (assuming I get tenured) might be my next legitimate opportunity. Until then I am looking forward to getting better at cyclocross this fall and then racing Triple-T with my Evotri team next spring! That sorta counts like an Ironman, right? !